There remains a fair amount of hesitation among some in the wider firearms community about teaching their children about firearms (especially those making the transition from urban areas where the very idea of addressing firearms with children seems verboten). 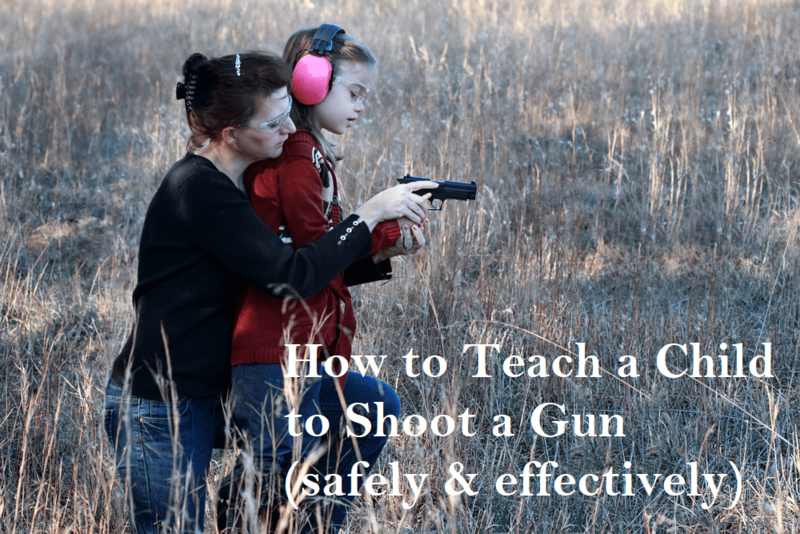 Of course, those individuals who have seen their families take an active interest in firearms, be it for hunting or simply target shooting, have long seen the benefits of teaching children to use firearms. Of course, there has been outrage in the media in years past each time a child injures or kills a sibling, friend, or themselves by using a poorly-secured weapon. In nearly all these cases, the child in question had no knowledge of the lethality of firearms. In a SHTF scenario, it is extremely likely that all too suddenly that this will become suddenly and brutally apparent to all, and the unprepared mind is even more likely to be traumatized. One of the best safety and preparedness measures in regards to children and firearms is to simply involve them in the experience. Long before any of my children were of an age to shoot, I would let them “help” in regards to cleaning my rifles. This generally involved helping oil our cleaning patches, and even operating the cleaning rod (with immediate, direct supervision). Of course, during this entire experience, the top priority was safety. Before they ever got the chance to “help out Dad”, they were instructed, repeatedly, as to the lethality of these items. I even found YouTube videos showing the penetration and destructive power of several firearms to assist in this. This is the sort of step that can start as early as the preschool years, and will form a firm foundation and appreciation for the lessons to come. An air rifle can be an excellent transitional complement to a child’s firearm education and experience. The same basic tenets apply in regards to the operation of an air rifle or BB gun as they do to a standard firearm. The lessons of checking/inspecting a weapon before and after use, knowing never to point the firearm anywhere you aren’t prepared to kill or destroy, and overall situational awareness can be achieved nicely at this step. The child may learn to identify the parts of the weapon and can take a sense of ownership in maintaining “their” weapon. My daughter was able to take this step at the beginning of her grade-school years and truly enjoyed learning to accurately hit some bright targets on the back of our property. Remember, you are the expert when it comes to your kids. You know their maturity level and can judge them better than anyone when it comes to their readiness and attitude. When you feel they are ready for the next step (and I have seen young grade school children reliably ready to step up after proper instruction), it’s time to consider that first rifle. For many of us, this is an absolute joy, knowing that we’re giving something truly special to the children. My advice: make a big deal of it. Link it to their demonstration of personal responsibility and attitude around the house, not just when they’re shooting with Mom or Dad. By doing this, you’re continually reinforcing that firearms are something special, worthy of their respect and proper judgment. There’s never a bad time to bring that lesson up for an encore! When you’re shopping for that first rifle, there are many fine weapons that will do nicely. For availability and ease of use for the general public, I would go with the ubiquitous Ruger 10/22. Happily, .22 LR ammo is cheap, the weapon easy to fire and maintain, and should be quite durable as your child progresses into young adulthood and beyond. While there are several fine models of the 10/22 that will do nicely for this purpose, I have seen good results with the 10/22 Compact and Carbine models. Also in the .22LR camp is the Marlin Model 60, which is often claimed by Marlin to be the most popular .22 rifle in the world. My advice is to take your time on this purchase, read plenty of reviews, stay within your budget (there are many fine firearms that won’t cost a fortune that are fine for this purpose), and realize you don’t need to get too fancy with this, regardless of what anyone tells you. As you move up into weapons that offer a sharp or booming report when fired, remember, hearing protection and other safety gear is doubly important for children, especially as their hearing can be negatively impacted by repeated loud noises. A visit to your local gun store or sport/outdoor shop should provide everything you need in terms of the right gear for your offspring. Remembering to show proper storage and security for firearms is also a must with this. If you’re new to the world of preparedness or firearms, you might not feel up to the task of teaching your child yourself or may want to seek out instruction for your whole family. Additionally, your current circumstances might not allow for you to simply head out to a remote part of the back 40 and have target practice. I have personally worked with two programs I can recommend, though a bit of internet research will provide even more. The first is 4-H’s National Shooting Sports Program (http://www.4-hshootingsports.org/), which is a program for youth active across the United States. The second is Project Appleseed (http://www.appleseedinfo.org/index.html), which has the admirable goal of teaching marksmanship and respect for our nation at the same time. There may be shooting clubs in your area as well that provide a community resource; make sure to ask around. Happily, learning the safe handling and operation of firearms can be a true bonding experience. Not only that, but the discipline and confidence one learns in safely and accurately discharging a firearm can be a boon to them in any situation (not just the worst-case scenarios we all endeavor to weather). Remember, training your child to shoot does not suggest that they will become a child soldier, scarred and traumatized, or a sociopath out to injure others. Nothing could be further from the truth. Hollywood and our society do much to alternately glamorize and demonize firearms; it is up to responsible parents, grandparents, and relatives to show our children the truth about these weapons. We all want to protect our children, and to teach them the skills to both provide for and defend themselves when they must. People fear or improperly use that which they don’t know. That is why firearms training, started and secured at a young age, can play an integral role in ensuring your entire family is prepared when a true disaster-level event hits. Regardless of when or if it happens, firearms training for children is an important, enjoyable, and rewarding activity for kids and parents alike. Youtube videos? That’s one way, but I took the kids into the back yard & showed them what a round would do to a watermelon & a cantaloupe. It seemed to get the point across fine, and graphically.